How Do Dolphins Use Echolocation? Welcome to the Dolphins Plus blog! Check in here for articles and updates regarding our marine family and the current happenings here at Dolphins Plus. Have you ever wondered how marine mammals such as dolphins and whales manage to hunt in turbid-water where light doesn’t penetrate? You have come to the right place. 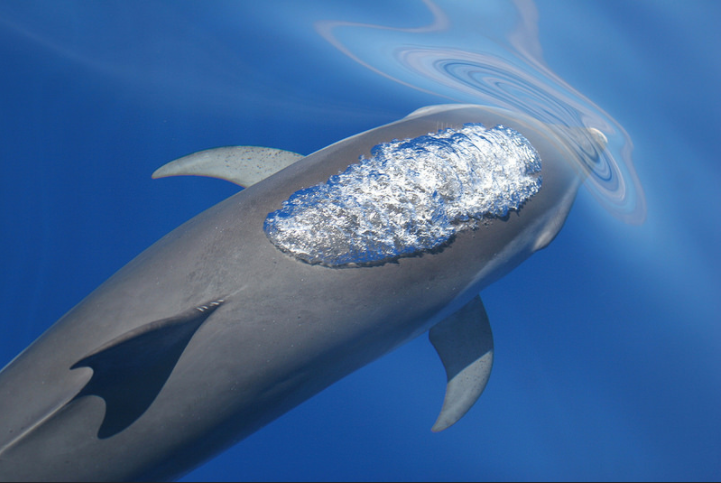 In this article, we will explore the process and function of dolphin echolocation. The way dolphins sail through the air and glide through the water is a magical view. Interestingly, dolphins and other animals such as porpoises, bats, and whales share a unique way of “seeing” the world through echolocation, also called sonar. In other words, dolphins can emit and receive the echoes of sound waves that bounce off any objects near them in the water. In front of the dolphin's blowhole, in the area we call our forehead is their melon. The melon consists of fatty tissue and fluid and serves as the lens, through which sound is focused during echolocation. Echolocation is seeing with sound, much like sonar on a submarine. They can only echolocate in the water and not through the air. Sound waves are created in the nasal sacs and focused through the melon at various frequencies, allowing the dolphin to "see" with sound. The sound waves travel through the melon and into the water and bounce off of objects of interest (like an echo underwater, hence the name). The sound waves then travel back to the dolphin and are received by their lower jaw, which is also filled with a fatty fluid. The sound waves travel from the jaw to the inner ear, to the nerves connected directly to the brain, where they translate the sound into an image. Echolocation works similarly to an ultrasound. 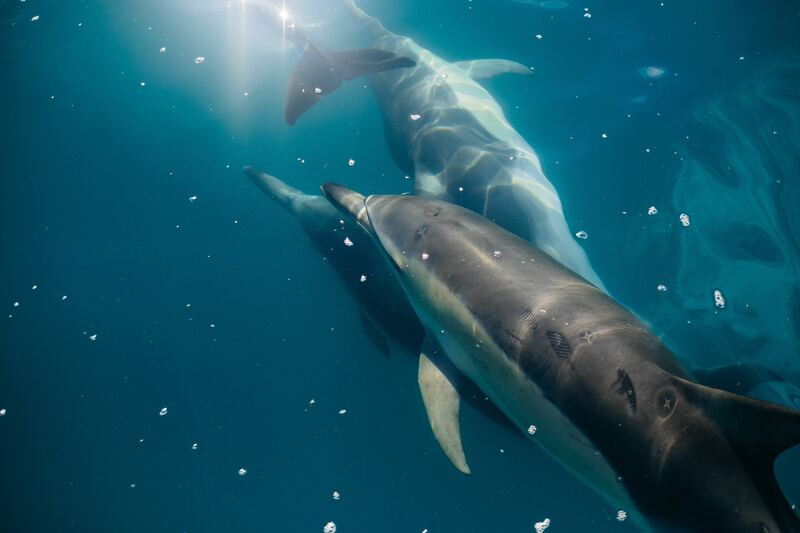 It gives a dolphin the capacity to explore their environment 3-dimensionally and aids in navigation and hunting in low light and low visibility environments. They emit sounds, or clicks, from their nasal passages, which are then passed through their melon (forehead). The melon is filled with fatty tissue and fluid and acts like an acoustic lens to focus the sounds in different directions. The sound waves then bounce off of objects of interest and are received by the dolphin’s lower jaw as an echo. This information is then passed to the brain via the inner ear. Echolocation is very efficient. Bottlenose dolphins are capable of distinguishing an object the size of a ping-pong ball from a football field away. This exploratory process is so efficient that they are capable of determining what an object consists of. The human body is comprised of about 75% water, and once in the water, we provide a prime structure for echolocation. In other words, we appear similar to an ultrasound to the dolphin. When a dolphin echolocates on a person, they have the ability to see muscle tissue, bone tissue, scar tissue, metal pins or rods, artificial body parts, and many subtle differences from one human to the next. Sound moves at a faster speed in water (1500 meters/sec) than in air (about 340 meters/sec); variables such as salinity, temperature and depth can affect the speed of sound in water. Since sound travels efficiently in water, dolphins utilize sounds via echolocation to orient themselves and survive by detecting prey. Most mammals produce sounds via vibrating vocal chords in the larynx (e.g., pinnipeds, sea otters, polar bears). Odontocete cetaceans (toothed whales) produce sounds from nasal passages. Sound waves are created in the nasal sacs and focused through the melon at various frequencies, allowing the dolphin to "see" with sound. In murky waters, visibility may be extremely low, thus dolphins rely on echolocation rather than sight to catch prey and avoid predators. Most odontocete cetaceans have the potential of emitting very high and low frequency sounds. These frequencies vary according to species and contexts. For example, dolphins can communicate with low-frequency signals such as chirping and whistling; however, when using echolocation they emit high-frequency sound signals. Echolocation has been investigated for decades by research scientists to further understand the complex mechanisms of this unique ability. However, additional work is required before we fully understand the specifics of echolocation. To learn more about dolphins, visit our Dolphin Facts page.